The Saint Benedict Press Signature Bible Presentation Case fits any of our Standard Size or Sacramental Gift Bibles perfectly. 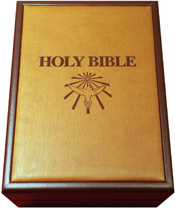 This is an heirloom quality case, in a rich two tone leather, embellished with "Holy Bible" embossed on the front. The interior is lined with a luxurious burgundy felt and includes our custom Sacramental Presentation Insert Pack for personalization. Give this beautiful case whenever you give the gift of Holy Scripture.